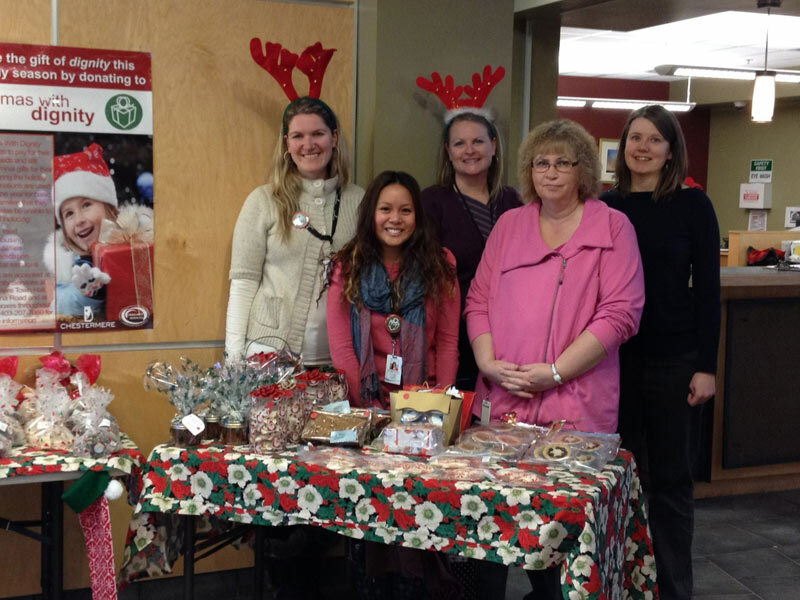 Because of the support of the community and hard work of the Community Services department at the Town of Chestermere, the Christmas with Dignity (CWD) campaign reached an incredible $19,000 in donations last year. The CWD program is an annual campaign that raises money for families in need in Chestermere. Money raised through donations is placed in a fund that is provided to temporarily help families pay for their basic needs such as food, shelter and transportation. “Another successful Christmas with Dignity campaign has come and gone, and Community Services and the Town of Chestermere could not thank our residents and community partners enough,” said Danielle Fermin, community resource co-ordinator for Chestermere Community Services. “There has been so much initiative and encouragement this past season, I am grateful to say we have had many special moments. From countless donations added to our children’s store, school’s fundraising ideas to support local families, monetary donations coming from churches, businesses and residents, a red and green donut showcased during Christmas time, and over 200 hours dedicated by our volunteers to put the planning committee’s thoughts into action- I am in awe!” Fermin adds. In addition to CWD, the Chestermere Community Resource Program also received funding from the Alberta Rural Development Network (ARDN). Like CWD, these funds will be used to help meet the needs of homeless and poverty as well as at-risk people while increasing awareness of these issues within Chestermere. This project is funded by the Government of Canada’s Homelessness Partnering Strategy which is aimed to address homelessness in rural Alberta. “A special ‘Thank You’ goes out to my funders, Alberta Rural Development Network and Child and Family Services Authority of Alberta, for supporting my work in supporting residents of Chestermere and area access to basic needs services,” says Fermin. “Thank you for your kindness and generosity; we are community that is truly working together to make this place our home,” the resource worker says to the residents of Chestermere. In an effort to encourage families to continue thinking about Christmas with Dignity throughout the year, Community Services has partnered with Chestermere Walks to create the Families helping Families Walk and Run. On Family Day (Monday, February 17) at the Chestermere Rec Centre you can disconnect from technology and connect with yourself, your family and your community at the Family Day: Unplugged event. At 1:00pm there will be a 1km and 5km walk/run or if you prefer, bring your cross country skis or snowshoes and travel a trail made just for you. Proceeds from the small donation of $5/person or $10/family to participate will go toward CWD. You can register in person at 12:30pm at the Rec Centre on the day of the walk. Then stick around from 1:00–4:00pm in the Rec Centre where you can join other families for an Unplugged Afternoon of Board Games & Family fun, including Zumba at 2:00 and 2:30pm. Hot Chocolate and soup or chili will be provided by the Chestermere Lions Club. Although Christmas is in the name and the majority of funds are used during the holiday season, donations can be accessed anytime throughout the year when families in the community need assistance. For more information on Christmas with Dignity, visit the town’s website at www.chestermere.ca/cwd.